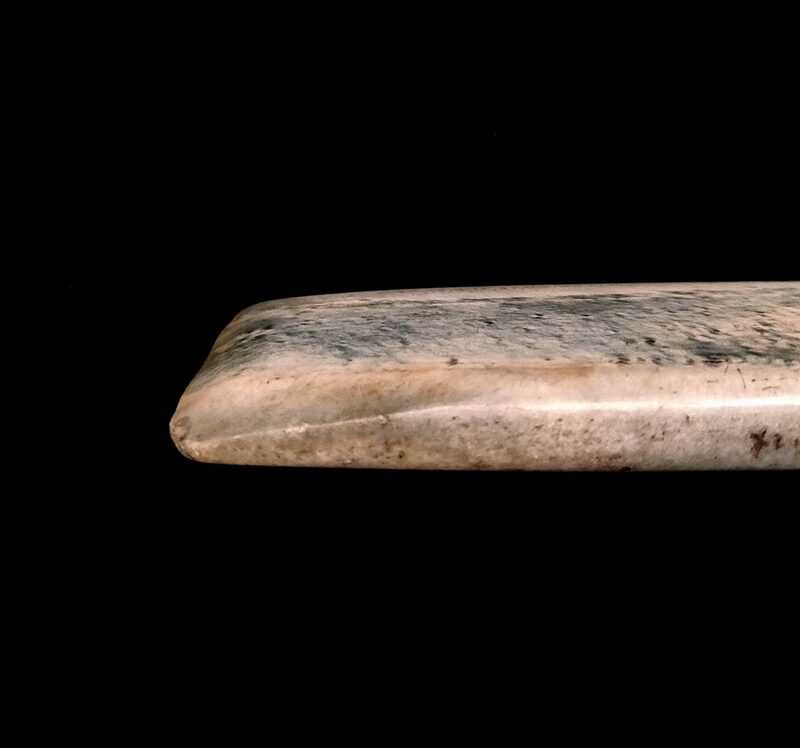 This powerful and elegant jade tablet is a remarkable example of ritual and prestige of the neolithic period. 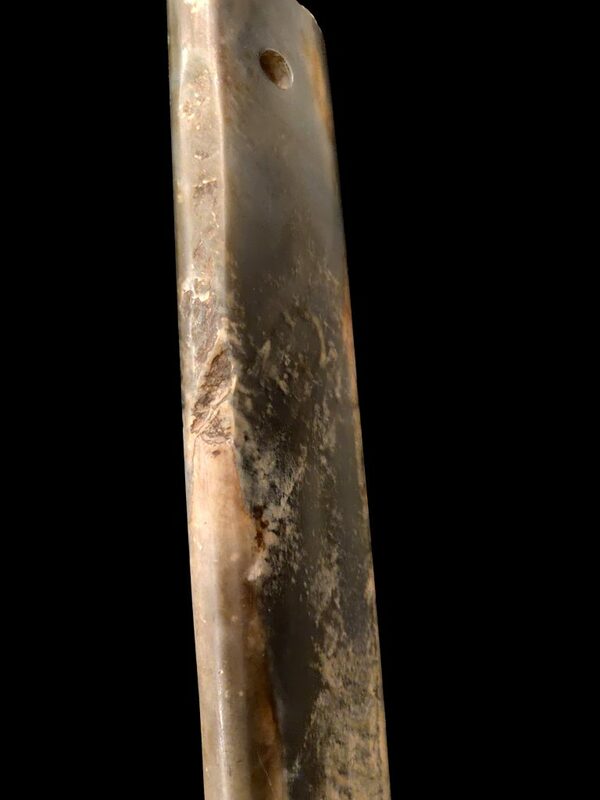 The well formed body of the tablet tapers showing a well beveled cutting end. 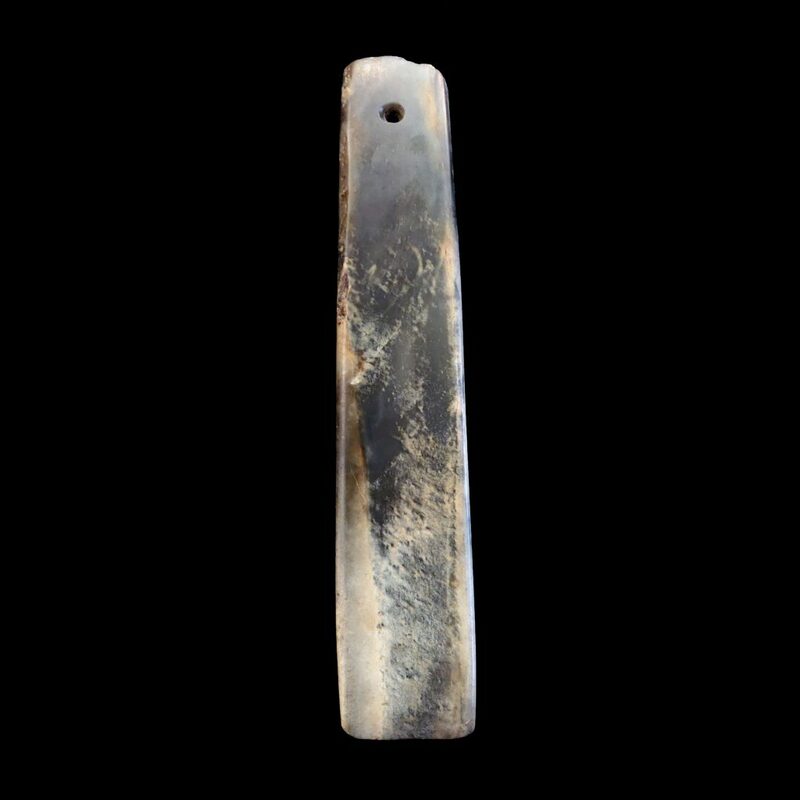 The opposite end of the tablet is left rough, since this end would have been attached to a long shaft of wood by leather strips. 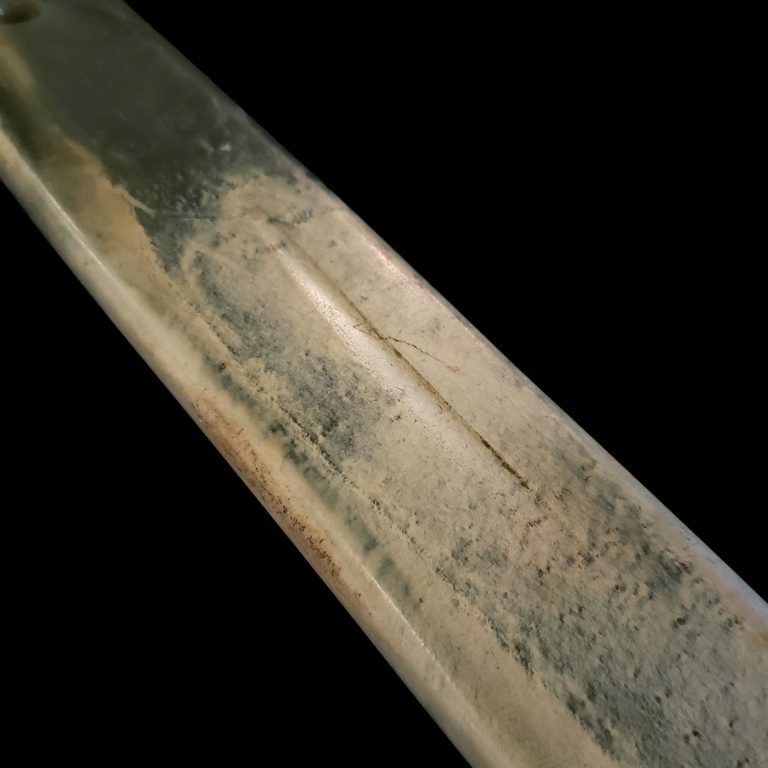 The mounting hole is drilled neatly on the tang end from both directions and shows a neolithic irregularity. The quality of the jade stone and the deep polish are consistent with Longshan-Shandong excavated examples. In his book Archaeology: the Science of Once and Future Things, Brian Hayden elaborates on the “Big Men” model which builds upon the idea that ambitious men could increase social and economic status by organizing the community’s feasts. As “Big Men” sought to out-do all others through these gatherings, they gained power by controlling the production of food and resources. All gifts received by the honored individual(s) at a feast had to be repaid with interest. Therefore, in the spirit of competition, each feast was more lavish than the last. This model is supported by the custom of burying prestige objects with a few male adults from Neolithic communities, and by the discovery of specialized feasting and ritual implements. The excavation of Neolithic tombs belonging to Chinese individuals of elevated status have yielded the richest discoveries of these implements. For example, one means of exhibiting power and success was the Liangzhu culture (c. 3400-2250 BC) practice of publicly displayed destruction through burning and burial of surplus wealth. This elaborate burial practice was for the benefit of the living, dominant group; it confirmed their power and success. In our opinion, the excellent workmanship of this tablet make it a fine example of the accomplishments in jade working of the Longshan-Shandong culture. Published: Collecting Chinese Art. S. Bernstein. University of Washington Press. 2000. Plate 9, Page 34. 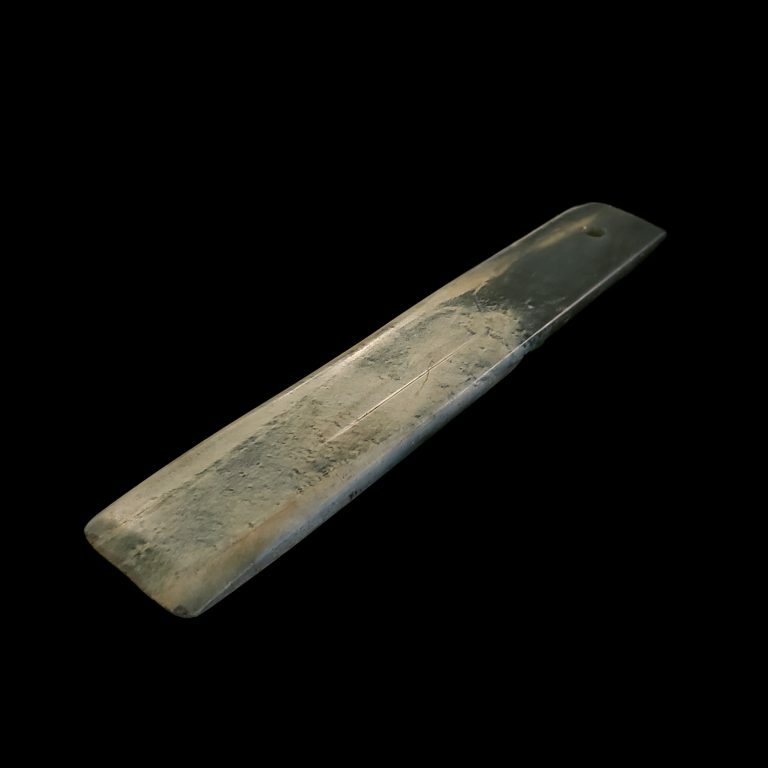 For a discussion of Neolithic blades, see “Neolithic Jade Blades: Feast and Ritual”, by Sam Bernstein, in Orientations, December 1993. Pages 59-61. 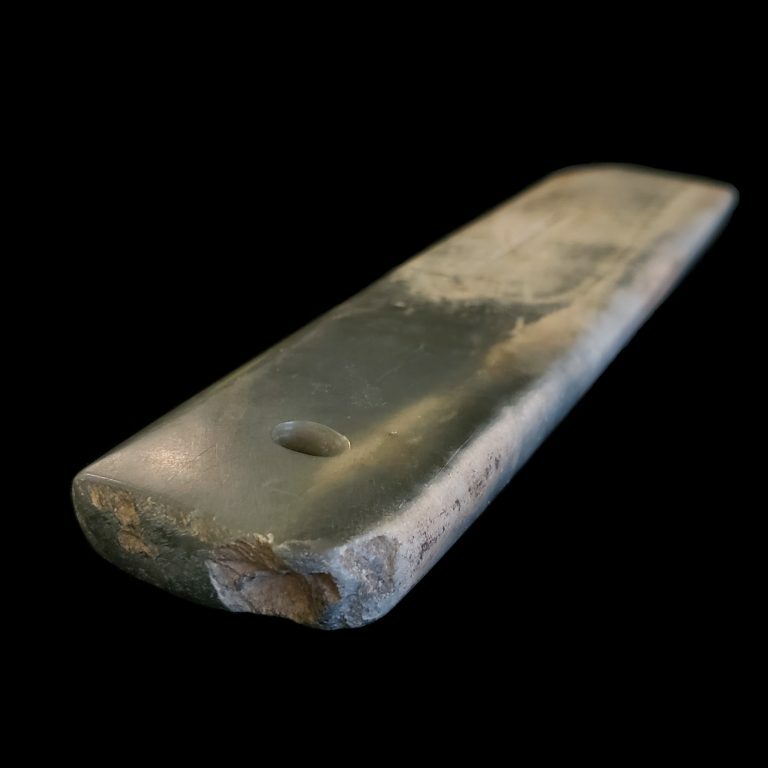 For a related example of a tablet, see Chinese Jade from Neolithic to Qing. Jessica Rawson. British Museum Press. 1995. Page 170, Plate 10:2. 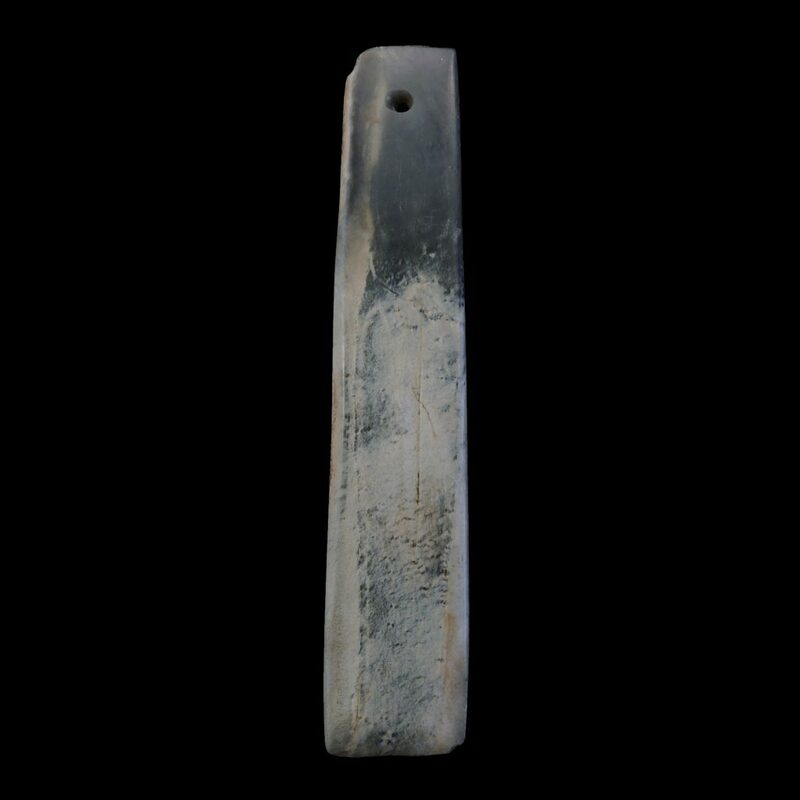 The cited example shows a similar quality of jade stone and high degree of polish. A detailed discussion of the “Big Men” model can be found in Archaeology: The Science of Once and Future Things. Dr. Brian Hayden. New York: W.H. Freeman, 1993. Pages 241-251.